If we are to believe the survival manuals and the “how-to-survive” articles published in the popular outdoor press, building a shelter from natural shelters in an emergency should be a piece of cake! After all, look at all the trees, bushes, bark and other natural materials you have to work with! Based on what we read there should always be a convenient hollow tree, rocky overhang or cave a person in trouble could use for shelter. It’s strange how when you are not in trouble any number of suitable shelters can be found but when you really need one – they are in short supply. Murphy’s Law I guess! 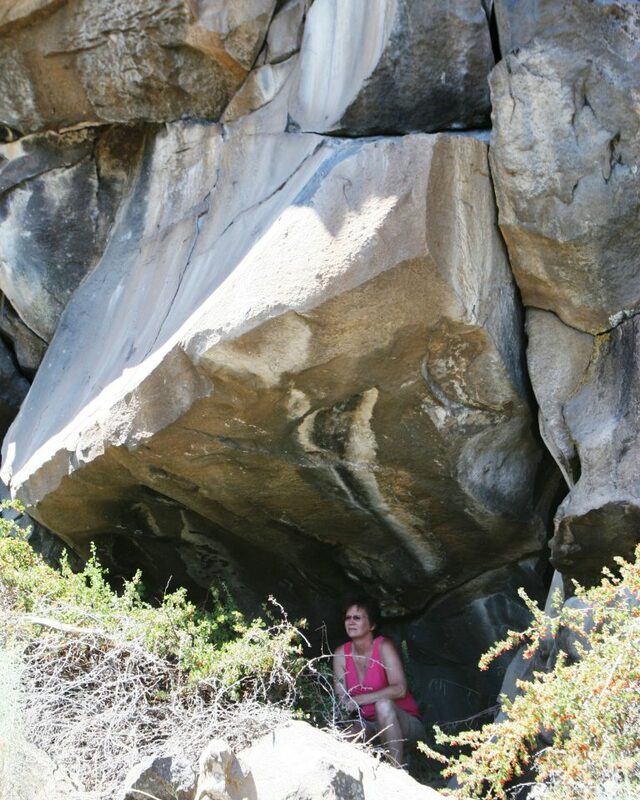 You can’t depend on finding a natural shelter when you need it! I have always believed that if you are going to need a shelter you had better have the materials with you to build it! I also believe that it is impossible for the typical survivor to build a waterproof, wind proof shelter from natural materials! Consider this: When does a survivor first realize that they need a shelter? Usually when the realization first hits that they are going to have to spend a night out that they hadn’t planned on. It’s late in the day, (maybe even dark already!) the temperature is dropping, the wind’s picking up, and it’s beginning to rain! This is not the time to be scrambling around the countryside trying to find the natural materials to build your home for the night – especially if you are injured! Have you even wondered how you would build a shelter from natural materials if your arm was broken? Shelters made from natural materials require time, natural resources, a cutting tool is helpful and a fully functional survivor who has practiced building survival shelters in the past! These commodities are often in short supply in an emergency! The survivor needs a waterproof, wind proof shelter now! Being able to protect yourself from inclement weather quickly is a fundamental requirement if you are to survive. Mylar blankets are largely useless. Mylar Space blankets and bags. Mylar space blankets are light weight, inexpensive, compact and largely USELESS in an emergency! Again consider the scenario I laid out earlier – it’s late in the day, cold, rainy, windy and the survivor is injured, hypothermic – or both! 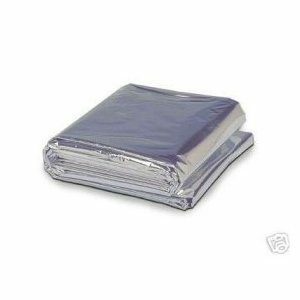 Space blankets are difficult to get out of the package, they are difficult to unfolded and drape around yourself – especially if you are one-handed in a windy situation! They are usually too small for an adult and require the use of both hands to keep yourself enclosed within the blanket. They are very noisy; (which might preclude you from hearing the rescuers) and tear very easily if nicked or punctured. Bags made out of the same Mylar plastic are also available however, other than the fact that they are a “bag” these devices suffer from all of the same flaws that blankets suffer from. I do not recommend products made from Mylar plastic for emergency shelters. Thermal blankets are similar to space blankets but are made from heavier material reinforced with fiberglass threads and with grommets in each corner. Thermal blankets can be used as a body-wrap but once again, depending on the size of the person, they are often too small to completely protect an adult. Some survivors have attempted to use a thermal blanket as a shelter roof by tying lines off lines to each corner and stretching the blanket between various anchor points. In benign conditions this may work, but with any wind loading or snow loading the grommets pull out very quickly and the blanket is destroyed. To erect a tube tent shelter, tie off a line to an anchor point (a tree), run the line through the length of the tube tent and tie it off to second anchor point. The tent is then spread out along the length of the line. The height of the horizontal line above the ground should be such that the tent can spread out enough to accommodate the occupant. The plastic that tube tents are made from comes in a variety of thicknesses. With one popular brand the plastic is only one mil thick which tears very easily. In order to withstand the abuse, and better meet the needs of a person having to spend the night out, the thickness of the plastic should be at least three mils – four mils is better. 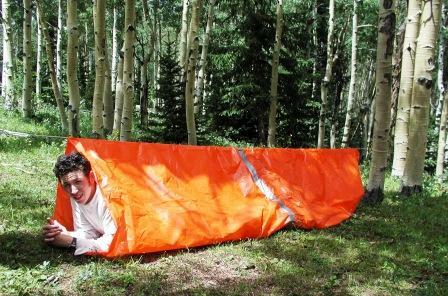 Tube tents can be improvised from large household trash bags by opening up the closed end of one bag, sliding it into the open end of the second bag and then duct taping the seams together. 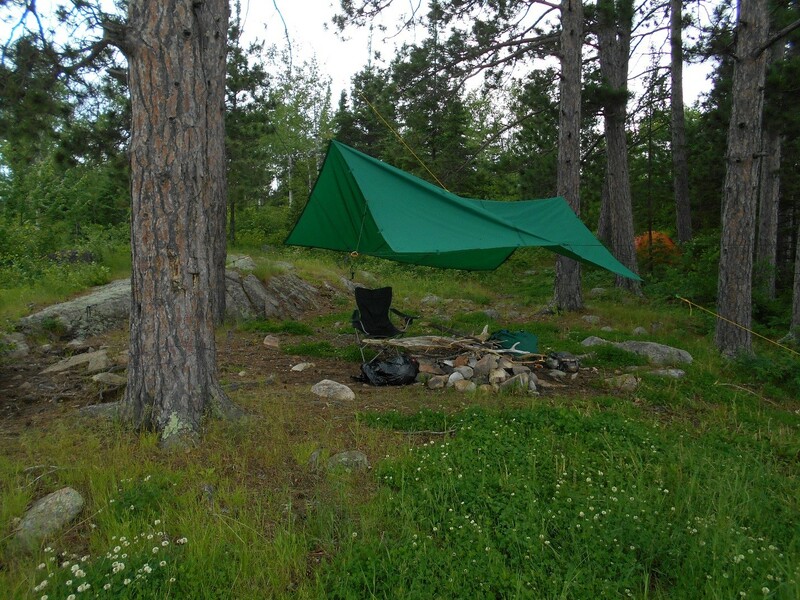 This A frame tarp shelter is easy to set up and effective. Tarps. Sheets of Visqueen plastic, painter’s drop cloths, canvas or other similar materials can be used to erect a wide variety of effective survival shelters. “Blue Crinkly” tarps are a readily available, inexpensive products from which emergency shelters can be quickly built. These tarps can be purchased from most hardware stores, come in a variety of sizes and are usually blue on both sides with grommets in each corner and at intervals along the sides. An eight foot by ten foot tarp is needed to provide the protection needed by an adult. Tarps of this size weigh about twenty six ounces and can be rolled up into a tube six inches in diameter by twelve inches long, which makes them very convenient to carry on the outside of a daypack or fanny pack. Tie ten feet of parachute line to each corner grommet before you go outdoors to expedite erecting the shelter when time is short. 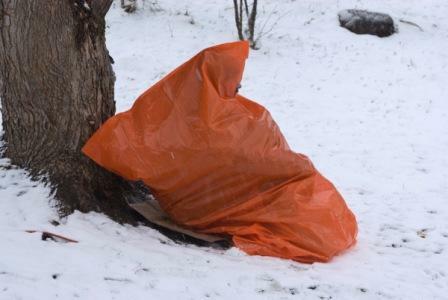 Tarps can be erected in a number of styles depending on the weather conditions that the survivor is exposed to. To erect a lean-to tarp shelter first select a line long enough to stretch between two trees far enough apart for the tarp to be stretched tight. Using a Timber Hitch, tie off one end of a line, about chest height, to an anchor then, rather than passing the line through the grommet eyes, insert a bend in the line through the grommet eye and place a short stick through the eye in the line. Repeat this process for each grommet stretching the tarp tight each time.. With the tarp attached to the line, tie off the other end of the line to the second tree, again stretching the line as tightly as possible.. 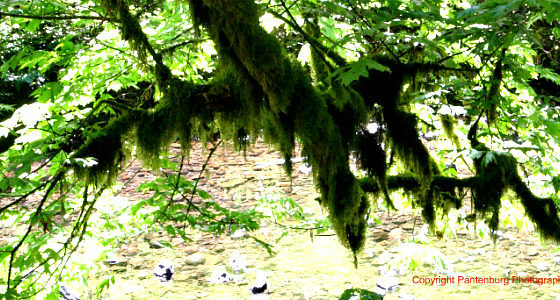 The lower edge of the tarp is then pegged to the ground or anchored with large stones or a length of log. If possible orient the shelter so that the lower edge points into the prevailing weather however if a fire is to be used in front of the lean-to, the front of the shelter should be parallel to the prevailing wind. Oriented in this manner the wind will carry the smoke away the shelter rather than into it. Large, heavy grade, (3-4 mil) orange plastic 55 gallon drum liners make good short-term, emergency shelters. It may be difficult to warm-up and dry out after becoming cold and wet and consequently you need a shelter that you can crawl under, or better still, crawl into quickly when weather conditions deteriorate. A large plastic bag serves this purpose very well. Totally encapsulating yourself inside a plastic bag is not a good idea. Apart from the need for oxygen, the water vapor contained in the air you exhale and your perspiration will condense on the inner surfaces of the bag and the occupant can get quite wet. To minimize this problem, cut an opening in the closed end of the bag just large enough to allow the user to pass their head through. The bag is then passed over the survivor’s head until their face aligns with the hole and the moist air is exhaled to the outside. When creating the hole, cut the plastic at ninety degrees to the fold to reduce the likelihood of the bag tearing along the seam. The hole should be just big enough to pass your head through when you are getting too warm and need to cool down. Being able to protect oneself from the onslaughts of the weather is a fundamental survival skill. Not to do so is an invitation to dying from hypothermia! Too many people venture into the outdoors without carrying a shelter, or the materials to make a shelter, thinking that they will be able to build one from whatever natural materials they find. Many of these same people find out too late that the clothing they are wearing is adequate when they are active but totally inadequate when they are stationary. Sheltering, i.e. defending your body core temperature from dropping below 98.6º F, begins with selecting appropriate clothing. With good clothing you may not need any other shelter. With inadequate clothing you had better have something in your gear to protect yourself from precipitation, wind and temperature extremes. Inadequate clothing places a premium on a survivor’s ability to find or construct a shelter and on their ability to build a fire. In the final analysis the only shelter you can count on is the shelter provided by your clothing. Pick it carefully! 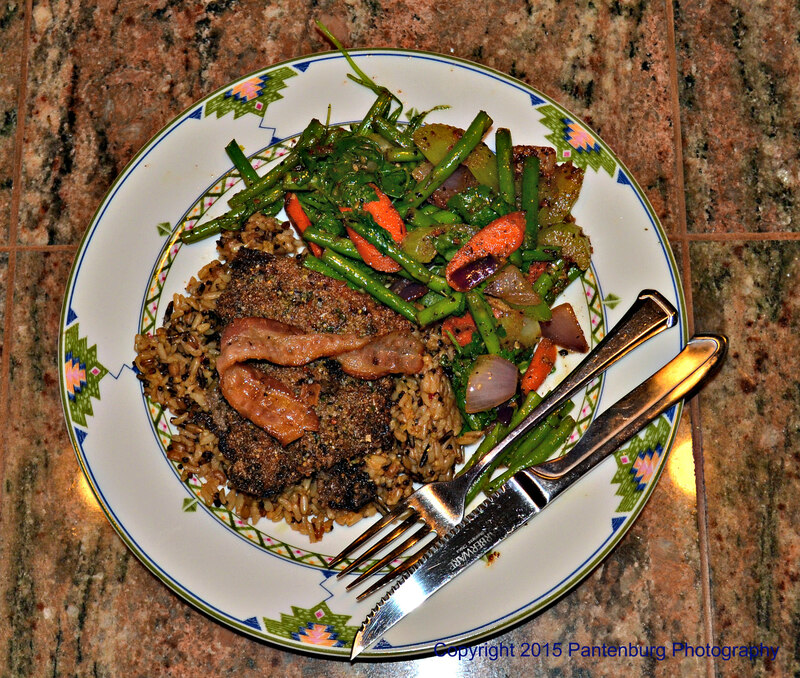 The only heat that you can count on is the heat your body is producing. Don’t waste it!! Kenya, East Africa and came to America in 1965 and joined the U.S. Air Force. He is a graduate of the Air Force Survival Instructor Training School and has served as an instructor at the Basic Survival School, Spokane, Washington; the Arctic Survival School, Fairbanks, Alaska, and the Jungle Survival School, Republic of the Philippines. 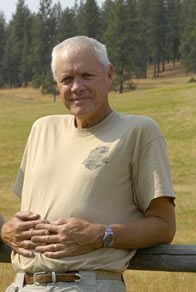 For twelve years, Peter was the Survival Training Director at the United States Air Force Academy, Colorado Springs, Colorado. He retired from the Air Force in 1995 after 30 years of service. He is the author of Surviving a Wilderness Emergency and has addressed over 20,000 people as the featured speaker at numerous seminars, conferences and national conventions.